Uveitis (sometimes called iritis) is a condition of inflammation inside the eye. The caused can be diverse and some times may be related to other inflammatory conditions in the body. There is usually eye pain, redness, reduction of vision and light sensitivity in the eye when an episode of uveitis happens. In advance stages, the vision get effected as well. Its important to treat uveitis quickly and appropriately so that permanent visual loss does not happen. Unfortunately, uveitis can happen again and again in the same eye or in the other eye. Multiple attacks can lead to permanent damage and visual loss. People with uveitis can get early cataracts, glaucoma, irregular shaped pupil (due to iris sticking to the lens), water logging of the retina etc. These problems caused by uveitis can cause permanent blindness. Most of the time, the treatments can reverse the damage to the eye specially in the early cases. Measures can be taken to reduce the eventual damage (damage limitation). Occasionally permanent damage can happen despite appropriate treatment. These decisions can be complex and depend upon the type of uveitis. Mr Saeed is an expert in Uveitis management and runs a clinic once a week at St Helier hospital dedicated to treatment of Uveitis and its treatment alone. He has also published articles on Uveitis as well and has established the Liverpool Uveitis database. 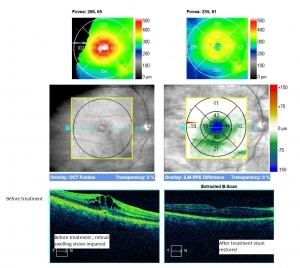 Mr Saeed will assess you and work out a tailor made plan for your level of uveitis You may have retinal photographs and scans to document your retinal condition. Mr Saeed will then explain your level of uveitis and treatment plan. You get your treatment at the time and date you want. Your treatment can be scheduled most days of the week. Consistency of treatment (you know who your doctor is and meet him at every visit compared to public sector hospital where you may meet a different doctor every time). You can get treatments not offered on the public sector (NHS). You get consultant delivered consultation, treatment, surgery and post-operative care.